Moving can be stressful — as we know!! Soon you’ll all get a close up look at the new KCA digs. But until then, we’re getting things perfect for classes. On stressful days a little comfort food is in order. There’s nothing like sitting around and enjoying some chips and salsa, or bean dip, or pico de gallo, or whatever concoction comes to mind. Normally the focus is on the dip; I mean a chip’s a chip, right? Sometimes the difference in an ordinary thing is the care we give when making it. Today, let’s focus on making the chips special. 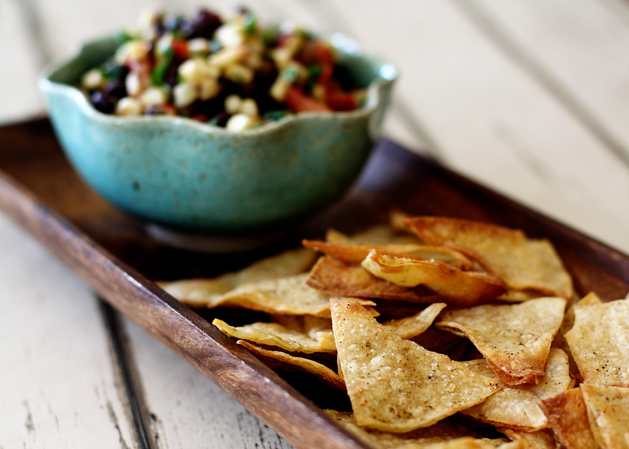 We’re turning to Katie Goodman of Craftzine.com, a fellow chips and salsa aficionado, to get this special, not too difficult recipe. As always, start by preheating the oven to 425 degrees. Stack four to five corn tortillas together on a cutting board. Cut the tortillas into eight triangles. You don’t have to do this stacked, but it does save time. Repeat until all the tortillas are cut. Then, pour about 1 tablespoon of olive oil on a backing sheet. Using a paper towel spread the oil all over the pan, evenly coating it. Lightly spray the tops of the tortillas with olive oil. Without a spray, you can use a brush to add just a little on the top side. Juice half a lime in a small bowl. Using a silicone pastry brush, dip and lightly brush the chips with a small amount of lime juice. How much lime juice you add can change the flavor. The idea is to have a hint of lime, but if you love lime, go crazy. Although, stay away from soaking the tortillas. You may think you like lime, but if that’s all you taste it may not be a good thing! Lastly, sprinkle the chips with salt and cumin to taste. Then, place the baking sheet in the oven for five minutes. Remove the tray and use tongs to flip the chips over. Then bake for another three to five minutes, or to your desired crispness. Top or dip the chips with whatever makes your taste buds salivate. Plus, it’s a great addition to any football party — it is Sunday! Tortilla chips are an interesting snack. First mass-produced in Los Angeles in the 1940s, they are often considered to be a Mexican food. Rebecca Webb Carranza was the brainchild behind the triangular edible dipping instrument when she needed a way to use misshapen tortillas rejected from the automated manufacturing machine. Rebecca and her husband ran a Mexican deli and tortilla factory. As any business owner knows, tossing a product means a loss in money. Rebecca cut the tortillas into triangles, fried them and began a popular snack revolution selling the bags for a dime a bag. In 1994, she received the Golden Tortilla award for her contribution to the Mexican food industry.